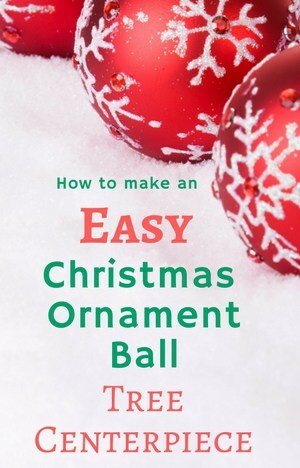 While browsing YouTube the other day, I saw a great video on how to make an easy Christmas ball tree centerpiece. I thought this would be a fun project to do at home with my girls – easy, inexpensive, and you can chit-chat while making one. It’s a great way to get into the Christmas mood, while making a centerpiece that you can enjoy all season long. Plus you can make different sizes and colors – I think it would be fun to make 3 in different sizes for a large centerpiece! This will be a great centerpiece for our dining room table. Remove all the tops from the ornaments. Apply hot glue to the top of one of the large ornaments, then press it firmly into the cone. Continue adding large ornaments to the tree, placing them closely together on the styrofoam cone. You can mix in medium size ornaments if you like. 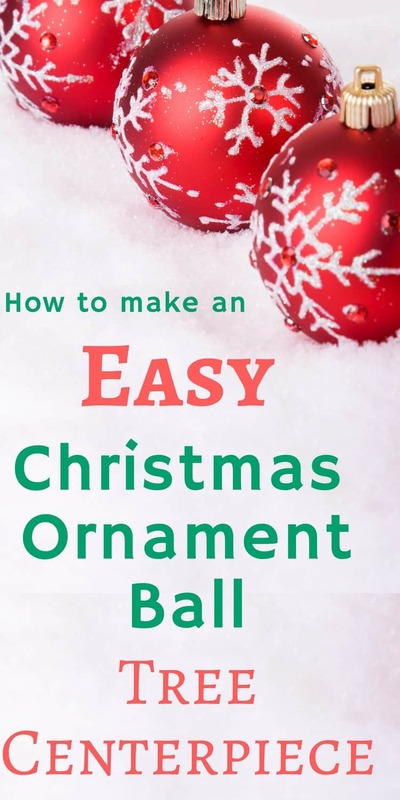 There will be some gaps in the ornaments – don’t worry; you can fill those in later on. Once you’ve gotten one layer looking the way you want, add a bit of hot glue between the ornaments. This will help stabilize the base. Arrange the next layer of ornaments (without glue) as closely as possible to the layer underneath it. Once the layer looks good, go back and glue the ornaments on. Add the next layer of glued ornaments as closely as possible to the layer underneath it. Continue adding layers of large ornaments until you’re about halfway up the tree. Switch to medium balls when you’re halfway up the tree. When you’re 3/4 of the way up the tree, switch to the smaller ornaments. Once you’ve added as many ornaments as possible, fill in the gaps by hot glueing the bead garlands. It helps to cut them in groups of 3 or 4. This project is easy enough for even the most craft-impaired person (such as me). Younger kids can get involved by placing the ornaments on the tree before you glue them. It’s a fun and inexpensive way to update your Christmas decor. The trees will look fabulous surrounded by candles as a centerpiece for your Christmas dinner or any holiday gathering!